“Wilson Perspectives: Combatting Corruption” is a series of short essays that originally appeared on WilsonCenter.org. As international funding to support environmental management and development increases, the danger of associated corruption grows and requires greater attention. Small-island developing states (SIDS), greatly exposed to the damage caused by climate change, are particularly vulnerable. These small, trailblazing countries in the Pacific, Caribbean, and Indian Ocean are making progress in addressing climate threats, but will need international support and local commitment regarding rule of law and corruption in the climate sector as they try to prevent the worst effects of climate change and find a sustainable way to develop. Under the agreement reached at the 2015 Paris climate conference known as COP-21, the wealthier nations committed to provide $100 billion a year toward climate adaptation in support of poorer nations. This flow of financing is likely just the start of large resource transfers. Along with these new flows of money will come new risks of corruption. Corruption in the climate sector is defined by Transparency International as going beyond the “abuse of entrusted power for private gain” and beyond the usual forms of corruption such as misappropriation of funds, seeking of bribery in the awarding of contracts, and nepotism. There are three further considerations: distorting scientific facts, breaching fair representation, and creating false claims about the green credentials of consumer products. At the same time, more traditional forms of corruption in the climate sector can undermine development efforts. For example, diverting money intended for building a coastal defense wall to an offshore bank account could lead to faulty construction or no construction at all. The result could be that the next time a hurricane strikes, vulnerable communities are devastated because of inadequate protection. The complexity, uncertainty, and novelty of the evolving climate architecture and policy framework that surround many climate issues create new corruption risks. Key operational concepts of climate issues are still being debated. One such question is how to assess additionality; namely, whether a project to reduce emissions would have occurred even without climate financing support. Another complicated issue is how to estimate restitution for loss and damage – the complete and irrecoverable loss of some things such as human lives, habitat, or culture, and the repairable damage of other things such as roads and property – caused by human-induced climate change. Existing regulatory gray zones and loopholes could be exploited. Inadequate representation and redress mechanisms for those most affected by climate impacts could reinforce inequities. Vulnerable, marginalized individuals and groups that are directly affected by climate change need to be able to access knowledge, determine means of action, and seek judicial redress to any inequities that may arise. Women, indigenous peoples, and the rural and urban poor are all in precarious settings. As climate financing grows, partly to address this inequality, it is crucial that these marginalized people are guarded against additional risk. At COP21, governments agreed to hold the rise in average global temperatures to “well below” 2.0 degrees Celsius compared to preindustrial levels, and subsequently to work on limiting the increase to 1.5 degrees. The 1.5-degree target is a win for small islands and other low-lying countries, which say that their lands and livelihoods are at risk if the world warms by any more. Despite great diversity among SIDS, many of these states have weak anticorruption measures and enforcement systems. In some, there are more government leaders and workers focused on manipulating government finance systems for their own benefit than there are people and resources pursuing accountability and the rule of law. You need to be choosing projects because they’re the most competitive – not for other reasons. You need to update and modernize not just the physical infrastructure, but your institutions and regulations. Rules need to be clear, transparent, and fair. Enforcement needs to be predictable under the rule of law. Courts need to adjudicate disputes fairly. You can’t bankrupt yourself on subsidies. Utilities need to be financially viable. It helps if you can harmonize your regulatory frameworks – so that businesses can look to invest in an entire region, rather than just in a single country – trying to navigate the unique regulations of every country in the region. SIDS leaders have recognized the reliability of enforcement systems as a way of preventing corruption. Auditor General Junior Patrick of the Marshall Islands, for example, recently asked, “What is the time frame for investigations and prosecutions, and what resources are available [for accountability efforts]? We have a framework, but is it functional?” For small islands, where enforcement capability is limited, this is one of the most important considerations. Several SIDS are considered “soft states,” with poor legislation and inadequate rule of law. Kinships and family ties can play a larger role in SIDS politics than in larger states, sometimes to the detriment of transparency and impartiality. “Closely knit” and “highly personalized” relationships characterize these small bureaucracies, promoting clientelism and rent-seeking. Bureaucratic corruption, if left unchecked, also can erode the social, political, and economic fabric of SIDS. Additionally, SIDS’ inability to influence the global economy is a key aspect of their vulnerability. High dependence on the global economy, combined with remoteness, isolation, and vulnerability to natural disasters, has debilitating effects on small economies, even though some SIDS have relatively high per-capita incomes. Addressing climate change requires urgent, multipronged approaches built on trust, cooperation, and solidarity. The kinship and “smallness” of SIDS may be well suited for these challenges. But they also require greater, more rigorous governance and clear rules and compliance mechanisms at the international, national, corporate, and local levels to address the causes and effects of climate change. These conditions will be a struggle for many SIDS. Corruption indexes point to a number of ways to overcome these risks, including press freedom, access to budget information (so the public knows where money comes from and how it is spent), integrity among people in power, and judiciaries that do not differentiate between the rich and poor and are truly independent from other parts of government. These factors must become a higher priority for SIDS if new flows of climate financing are to result in gains. As noted by analysts, when rampant corruption coincides with high vulnerability, sustainable development efforts are endangered. Corruption, climate change, and vulnerability are not inherently connected. But reform, anticorruption policies, and enforcement capacity are clearly key in vulnerable small-island states set to receive significant climate financing. Sources: Aidt (2010), Pacific Institute of Public Policy, Phillip (2012), Transparency International, The White House. 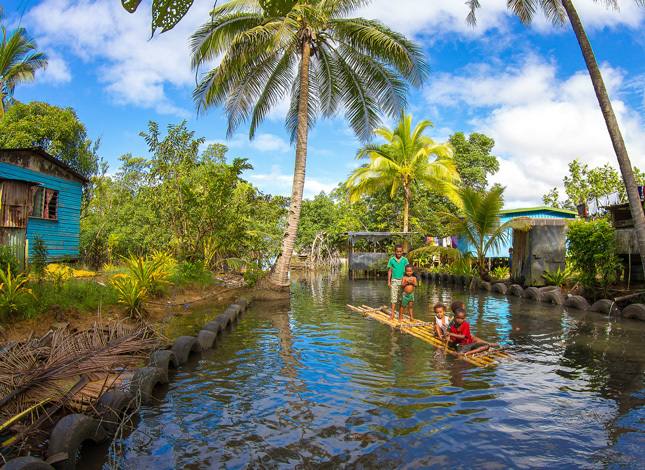 Photo Credit: Children play on a raft in Fiji, courtesy of flickr user Nick Hobgood.